To be a Christian is to be one who believes. But believes in what? In an age of cafeteria-style religion--a little bit of this, a little bit of that--believers new and old may be overlooking the basic tenets of faith in favor of modern trends that have no biblical basis. For millennia, Christians have affirmed the Apostles' Creed because it summarizes the tenets of Christian belief, boldly declaring that there is uncompromising truth that is foundational to life. In this book, renowned theologian R. C. Sproul presents the creed statement by statement, unpacking what it means to believe in God the Father, Jesus Christ, and the Holy Spirit, and what Christians believe about the church, salvation, and eternal life. Dr. Sproul is truly a biblical scholar and he communicates as such. He is a scholar for which I hold great respect. What We Believe is the first of his books that I have read; well, attempted to read. Sproul is a theologian and I believe that he is speaking to other theologians. He engages minds and in my case that necessitated the need to become very familiar with my dictionary. I gained knowledge but I felt out of my depth. I need more smarticles. Embarrassing to admit but true. Many apologists of the Christian Faith exist providing clear scholarship and excellent value. 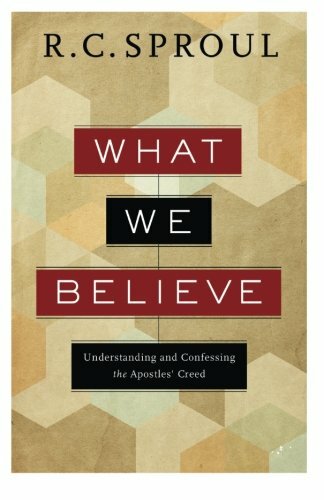 I was drawn to read What We Believe, one of Sproul's apologetics books, based upon his step-by-step exegesis of the Apostles' Creed. from whence he shall come to judge the living and the dead. In case you are not a theologian as I am let me point out a statement which confused me. My husband cleared it up for me. The statement towards the end of the creed which says "I believe in the holy catholic church" threw me as I am not Catholic. Darrell informed me that the lowercase catholic means the universal or world-wide church as opposed to the uppercase Catholic specifying the Catholic religion. I cannot claim to have finished What We Believe but I do highly recommend that you give it a try. R. C. Sproul is founder and chairman of Ligonier Ministries and the author of more than ninety books, including The Holiness of God, Faith Alone, and Everyone's a Theologian. He is also copastor of Saint Andrew's Chapel in Sanford, Florida, chancellor of Reformation Bible College, and executive editor of Tabletalk magazine. Dr. Sproul's teaching can be heard daily on the radio program Renewing Your Mind, which is broadcast on hundreds of radio outlets in the United States and in more than forty countries worldwide.